In the atrium of McCamish Pavilion, where there is sometimes raucous cheer, there were quiet murmurs and soft music, pierced only by the staccato of consolatory pats on the back. On Monday, members of the Tech community gathered to celebrate the life of Brandon Adams, a third-year business administration major and football player who passed away on Saturday. Adams was 21. By one of the entrances, reporters surrounded Paul Johnson, Adams’ last coach. Also in attendance to pay their respects were athletic director Todd Stansbury and new coach Geoff Collins. The ceremony began at 5:30 p.m. and lasted for a little over an hour. It was emceed by Derrick Moore, the football team’s chaplain. After a brief prayer and reflection, Moore ceded the floor to four speakers who memorialized Adams and his time at Tech. These individuals were Stansbury, assistant athletic director for student-athlete development Leah Thomas, head football trainer Mark Smith and defensive linemen Brentavious Glanton and Kyle Cerge-Henderson. Each speaker had unique memories of Adams, but a few common themes ran through their remarks. Adams was gregarious and known for his enveloping hugs; his nickname, “Big B,” referred more to his personality than his stature. He was deeply committed to improving his craft as a football player. And as both Glanton and Cerge-Henderson emphasized, he was an outstanding teammate. Perhaps the most powerful anecdotes came from Thomas and Cerge-Henderson. Thomas told the story of how her young children met Adams at a Tech softball game — a sport Adams fiercely supported — and formed a strong friendship. Adams would chase after foul balls and negotiate with concession stand vendors on the children’s behalf. “He was a teammate to everyone,” Thomas said. That much was made clear by the presence of countless student-athletes, ranging in such diverse sports from cheerleading to women’s club soccer. Cerge-Henderson told the audience of a bond Adams formed with Cerge-Henderson’s young daughter, bringing her cheese puffs for her birthday each year and promising to do so in perpetuity. Through tears, Cerge-Henderson vowed to keep up that tradition in Adams’ memory. The ceremony concludes with a rendition of Adams’ favorite Tech tradition: the fight song. Then, football players, coaches and administrators passed by Adams’ family, seated in the first row, to offer them hugs and condolences. After the ceremony, Geoff Collins entered the press room to answer questions. “We’re all heartbroken as a football family, as an Athletic Association, obviously as a university,” he said. Even in his brief time around Adams, he observed “the love he had for other people [and] the love other people have for him.” Spring practice had been scheduled to start on Tuesday, and in a team meeting, players decided not to push that date back but instead close the first day of practice to the media. In the short term, Collins plans to honor Adams by leaving his chair in the team’s meeting room unoccupied and attaching decals bearing his number to the team’s practice helmets. He added that players had ideas of how best to recognize Adams during the season but that those discussions were for a later date. After all, Tech is more than five months away from its season opener against Clemson. Brandon Adams was a rising senior defensive lineman. He would have been a member of the team’s 2019 starting lineup. As Glanton once assured a reporter when asked about the team’s depth at defensive line, Adams certainly had a shot at playing football professionally, if he so wished. But perhaps it is better to remember Adams for what he accomplished. His final home game was an overtime win against rival Virginia Tech. 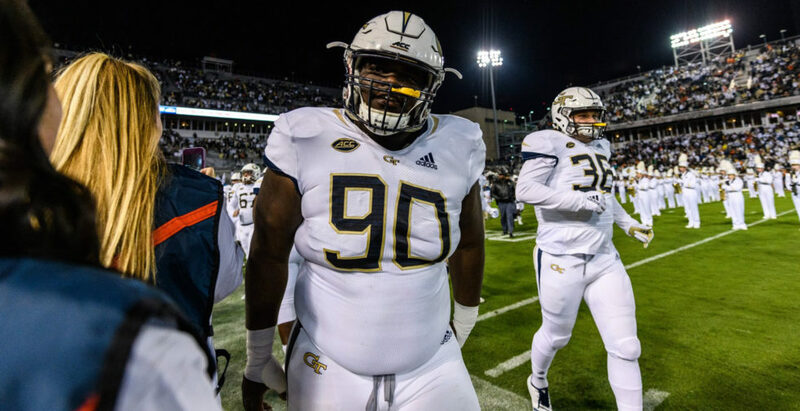 In his last game against Georgia, he recovered a fumble while playing with an injured hand. And in every remark, it was clear how much he was loved and respected by friends, teammates, nutritionists, coaches and everyone else who worked with him. There will come a time when this section writes about the impact of Adams’ passing on the defensive line, Tech’s run defense and so forth. That time is not today. Today, the worthy subject is the impact of Adams’ passing on the lives of the many people who loved him. That impact is both profound and widespread.